If tour games are all about acclimatisation, then Leicester did its best to prepare Sri Lanka for Leeds next week. A blanket of cloud, a chill in the air and early pace in the pitch offered a taster menu for Headingley. Although it is safe to say the huddle of autograph hunters that greeted their every appearance at the pavilion steps were a touch more welcoming than a well-oiled Western Terrace. The final day of their previous tour match against Essex was washed out by rain, so there was an onus to get as much as they could from this three-day outing at Grace Road. With that in mind, Sri Lanka coach Graham Ford and his squad have come into this match "not trying to figure things out" but simply to get players to adapt and get into form. An extra spot was found with Angelo Mathews dropping out of the XI. He spent the morning bowling on a practice pitch before disappearing for a handful of nets throughout the day. Dimuth Karunaratne's stay was short, bowled comprehensively for a duck by left-armer Atif Sheikh with the fourth ball of the day. Of the top order, his place is probably the most assured for the first Test, with two hundreds among 769 runs in 2015 and having shown aptitude in English conditions on the previous tour. Graham Ford, Sri Lanka's coach, has said that Kusal Perera is a "tremendous" player and expects him to be considered for the one-day series against England next month. Doping charges against Perera were dropped earlier this week and he is now free to resume his career after being suspended for five months. "It's great because he's a wonderful cricketer and we have missed him," Ford said. "He's a tremendous player - in all formats - and I'm sure the selectors will be thinking about him for the one-day series. I'm not sure what the thinking is regarding getting him into the Test squad, but it's great news to know he's available again." His early dismissal provided another opportunity for 21-year-old Kusal Mendis to etch his name into the No. 3 spot. Mendis is the young contender. The one whose path to the top is set out by those around him. Schoolboy cricketer of the year, Sri Lanka Under-19 captain - these are the sorts of titles awarded to those expected to make their mark in the wider game. Milestones to would-be greatness. And with that comes resistance from some quarters. Understandably so, considering Mendis has only one first-class hundred to his name. When Mendis was drafted into the Test squad for the West Indies series last year - he made his debut in the second match, in Colombo - Mathews was quick to go on the record and back him. While the captain also stated that it was important not to put pressure on him, his performance here, in testing circumstances, shone out in the morning gloom to such an extent that he could be given the series at first-drop. Asked whether he would be ready for the challenge, Ford responded in the affirmative: "Without a doubt. "He's had two good innings. He played nicely in Chelmsford and nicely today. He's a young lad who has shown enormous amount of talent and we need to get him to turning those starts into really big scores to make a difference. He's got the technique and temperament to handle it. I'd be more than happy to see him playing these Test matches." Kaushal Silva struggled, particularly against Sheikh, who bowled the sort of quick, controlled opening spell that led you to question why this was only his 10th first-class match. The answer lies with the bowler himself. But Silva wore a few and, while Sheikh occasionally beat Mendis, the right-hander kept his cool and rotated the strike with ease. Smartly, he was able to appreciate Sheikh's speed from the safety of the non-striker's end. Their partnership of 101 from 28 overs looked to be the starting point for a procession of runs, but most of the batsmen failed to oblige, collapsing from 124 for 2 to 185 for 7 in the afternoon session. 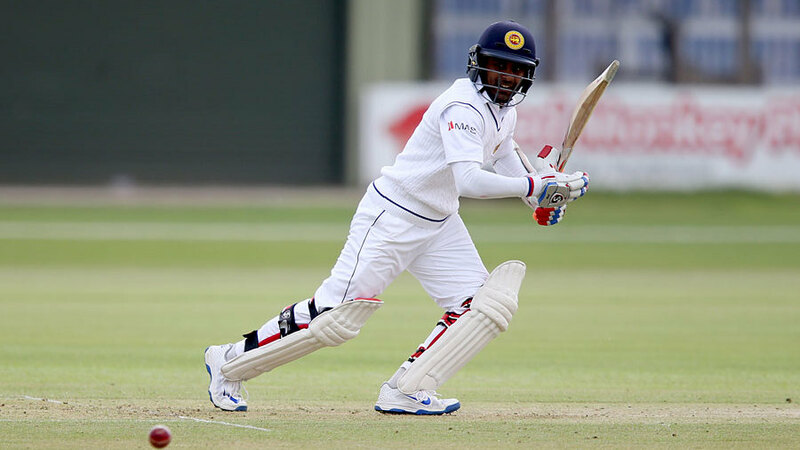 In among the wreckage was an unconvincing 6 off 17 balls from the returning Lahiru Thirimanne, who lost his Test place to Mendis last year, and 19 from the other potential No. 3, Niroshan Dickwella. Ford conceded that the collapse and the form of the middle order in general are a cause for concern. But just when it looked like Leicestershire - who had made nine changes from their Championship side - might rattle out Sri Lanka for an embarrassingly low total, the No. 8 Dasun Shanaka helped his side save face. Having made his name as a hard-hitting T20 allrounder, he forgot about the white clothing and the red ball and retained his dead-eye and ridiculous bat speed to strike a blistering 91 not out. Of his 12 boundaries, three were sixes: Jigar Naik taken for two down the ground before Tom Wells was planted on to the concrete beyond midwicket. When the 90 overs were up, the Leicestershire fielders and umpires led the way out of the cold. Shanaka and Rangana Herath had a brief chat in the middle, having shared a stand of 126 in 26.4 overs, before following them. One imagines Sri Lanka will leave it there - or maybe come back for a brief thwack to get Shanaka nine more runs for a fourth first-class hundred - before giving their bowlers a full run out.